The calendar seems to fill quickly in the month of December, doesn’t it? From holiday parties to end-of-year appointment to travel, it can sometimes be tricky to find time to run during this busy time of year. That’s not to mention that the below-freezing temperatures and snow make us want to spend more time inside, drinking coffee or hot cocoa by the fire or under blankets. Inclement weather and a busy schedule doesn’t mean that you need to skip out on your runs! Running offers numerous physical and mental health benefits, which we certainly need this time of year when can use the stress relief, emotional release, and exercise. Try one of these five quick and effective running workouts for the holidays to stay fit, healthy, and sane during even the busiest days of December. All of these workouts take 45 minutes or less – enough time to squeeze out the door for a run while visiting family or sneak out for a lunch break run during a busy day at the office. All of these workouts can be done on the treadmill or outside, whichever is the most convenient and preferable for you. Each workout includes a warm-up and cooldown and will have you sweating and coasting on that runner’s high within 30-45 minutes! If you wish, you can increase the warm-up and cooldown duration of these workouts up to 20 minutes each, which will make most of these runs last for an hour. If you’re very short on time, don’t cut out the warm-up or cooldown; rather, decrease them to five minutes each. 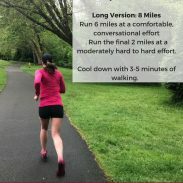 Tempo runs are one of my favorite workouts and a highly effective running workout for building speed and endurance, especially if you are short on time. After running at an easy pace for ten minutes, increase your speed to a comfortably hard pace. If you’re running by effort, you should be breathing in for two counts and out for two counts and be able to say short phrases but not full sentences. If you’re running by pace, aim for a pace roughly between your 10K and half-marathon pace (15K pace for most runners). You should finish the 20 minutes feeling as if you could have gone for bit longer – you don’t want to race this workout. Cool down with ten minutes of easy running. Progression runs are run in which you incrementally increase your speed. There are endless variations, but this progression run gives you a great workout by having you run at multiple paces. After running one mile at an easy pace, pick up your pace to approximately marathon pace (or moderate, if you’re running by effort) for a mile. Without slowing down or taking a break, then speed up to half marathon pace (comfortably hard) for a mile. For the final mile, push yourself to run at 5K to 10K pace, or at a hard effort. If needed, add on 5-10 minutes of a cooldown jog. Fartleks are a great effort-based interval workout that you can do on the treadmill, trail, or roads. 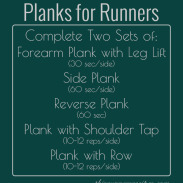 After a ten minute warm-up at an easy pace, run hard for two minutes and then recover at an easy pace for one minute. Repeat this cycle of two minutes hard, one minute easy for a total of five times (this will take 15 minutes). Run at an easy pace for ten minutes to cool down. Hill repeats are like a combination of speed work and strength training all in one short workout. After warming up for ten minutes at an easy pace, find a hill with a 4-8% incline. Run at a hard effort up the hill, while maintaining a quick cadence and proper running form, for 30 seconds, then jog back down the hill and around the bottom for 90 seconds. 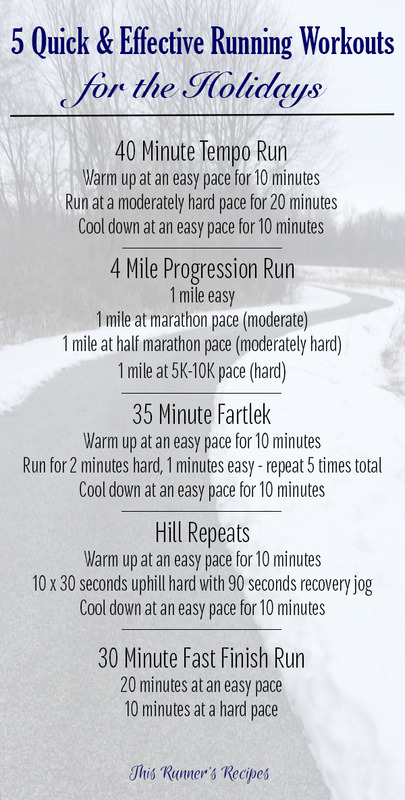 Repeat for a total of 10 hill repeats and then cool down with ten minutes of easy running. A fast finish run is a type of progression run and lets you make the most of a short 30 minute workout. Run at your normal easy pace for 20 minutes and then pick up the pace for the last ten minutes. Your effort should be hard but not all-out; by the end of the run, your breathing should labored but you should be able to catch your breath quickly once you stop. 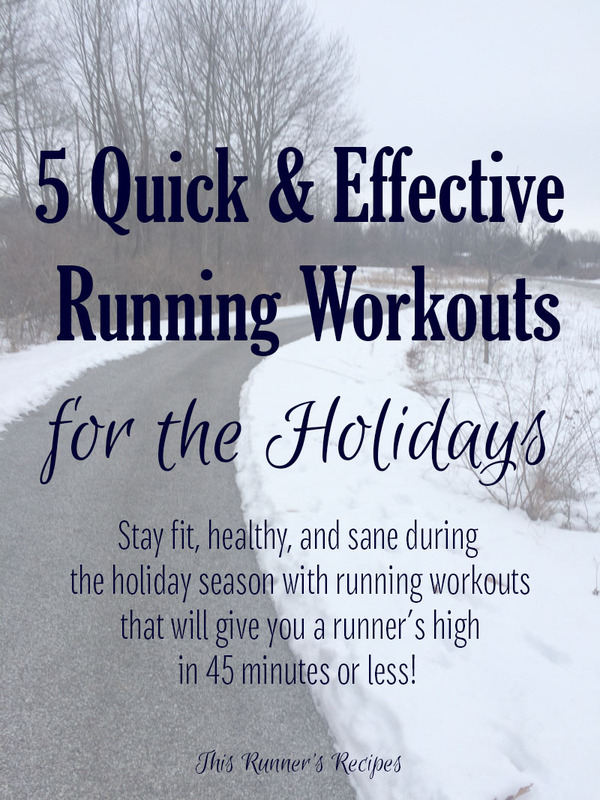 If desired, add a 5-10 minute cooldown run at an easy pace. I’ll be linking up with the lovely Jill Conyers for Fitness Friday! What’s your go-to workout when you’re busy? Do you prefer the treadmill or the outdoors for your winter runs? Love this! I much prefer the outdoors but last winter I did do really well on the treadmill which I need to remember for this year! Thank you! The treadmill really is a great option for winter, even though I do prefer the outdoors as well – most of last winter I was on the treadmill as well! These workouts looks great! I know in a month or so I will be looking to add in a few workouts without doing real “speedwork”. I don’t treadmill really- if I have to go to the gym due to weather, I usually do the arc trainer or lift weights or do yoga. It doesn’t get cold here though. It does get crazy hot in the summer, but I usually do those runs outside too because while summer running is hot, it’s not dangerous like running when there’s ice or something. All of these look like great workouts- my go-to for time crunched days is intervals on a .25 mile stretch of road by my house. Thank you! Those intervals sound like a great workout – quarters are never easy! That’s so true about summer running – it’s never dangerous! Ice is always what kept me inside during winter runs. You’re so lucky that you don’t get ice like that! These are all great options to get in a great workout without having a ton of time. Saving it for sure :-). I try to run outside as much as possible in the winter but know that come January I will probably be inside most days running on the treadmill. When I’m busy but looking for a good workout/run I go for a fartlek or tempo run. Hope you’re having a great week! Thank you! Januaries were always treadmill months for me back when I lived in Indiana – hopefully this winter isn’t as bad in the Midwest so you can get some good outside runs! I hope you’re having a great week, Angie! My go-to workout when I’m busy is YOURS! The one I keep doing every week. I hate it but it’s perfect. I love it when you post running workouts! They’re my favourite. I’ll definitely be coming back to these as soon as my quad feels a bit better. I’ll run today but just at an easy slow pace. I cannot tell you how excited/honored I feel whenever I see you post it in your Mileage Monday! And thank you so much – I hope to keep posting more! I really hope your quad feels better soon! Thanks for these suggestions, Laura! I hate the treadmill, but I’m also a baby when it comes to rain. Gotta take advantage of the nice Seattle days! Thanks, Lauren! I definitely agree – take advantage of the nice Seattle days, especially when there’s rain coming up in the forecast! At least it’s better than snow and ice. I’ll take the outdoors anytime I can but sometimes it’s so much easier to throw on whatever and hit the treadmill when I’m short on time. This time of year means more layers and more time! I love the outdoors also, but it does require so much time to bundle up! It’s often worth it though for the fresh air. My go-to workout when I’m busy is a 30-45 minute dance cardio workout with a short strength section at the end. That’s what I’ve been doing the past few days! Sounds like a great workout! 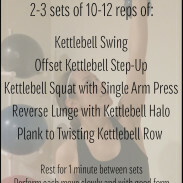 I love those short workouts that do the trick on busy days! I am firmly in recovery mode so my favorite run will be an easy run – although I really need to motivate myself out of recovery mode pretty quickly. I do love tempo runs. I never run on treadmills unless I have to. I am not a good treadmill runner – my form is off and I’m prone to very clumsy and embarrassing accidents. I hear you on the easy runs! I’ve been in maintenance mode for weeks and the easy runs are just so nice. Treadmill running is tricky – I’ve embarrassed myself more than once as well on the treadmill and nearly broken my phone several times! Love these suggestions! I feel like my usual thing to do is to just run the same pace the whole time, so once I get back to running I’m going to try to mix it up with these instead! Thank you! I fall into that same trap also when I’m not training, and runs like these are a great way to add in speed without exhausting the body! Thanks for pinning it, Jill!